As The New York Times reports, people who are stepping up to buy the Nissan Leaf are getting a whole host of government incentives—and the royal treatment from Nissan. Since Mr. McNaughton, a lawyer in Nashville, paid his $99 deposit, he has been bombarded with government incentives — promises of a $7,500 federal tax credit, a $2,500 cash rebate from the state of Tennessee, and a $3,000 home-charging unit courtesy of the Energy Department. When he had some basic questions about the Leaf, the answers came in a 40-minute telephone call from a senior manager in Nissan’s corporate planning department. “You kind of feel like you’re one of the chosen people,” Mr. McNaughton said. The US government have set a target of one million electric cars on the road by 2015 in an effort to reduce the nation’s reliance on imported oil. 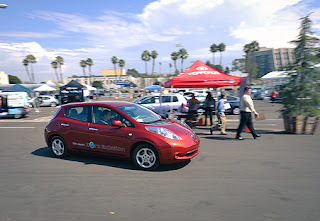 Contributing towards that effort, Nissan plan to sell up to 500,000 electric cars worldwide by 2013 with 150,000 annually to be built in Franklin, Tennessee. With the US fleet of 250 Million turning over every 10-15 years, it's understandable that no opportunity is being missed to smooth the take off in sales of Electric Vehicles to the general public. Significant momentum is needed to go from a standing start to multi millions of EVs sold in the span of just a few years.